Cardinal flower (Lobelia cardinalis) of the Bellflower (Campanulaceae) family is a showy herbaceous perennial. In the U.S., it occurs from California, Nebraska and Minnesota, southward and eastward. In Arkansas, it occurs statewide. Cardinal flower is found in year-round moist to wet soils along streams and lakes, prairie swales, springs, swamps, ditches and in low lying wooded areas. It typically occurs in partially shaded areas, but is also found in sunnier areas near or in shallow water. The genus name recognizes Matthaeus Lobelius, a Flemish 16th-century physician and botanist who is credited with being the first to attempt to classify plants by attributes other than their medicinal uses. The specific epithet and common name likely associate the bright red color of the flower to red vestments of Roman Catholic Cardinals. Cardinal flower, which forms clumps, has mounds of basal leaves in spring from which multiple, erect stems typically up to 5 feet tall grow. Stems are not normally branched, but when a stem is broken off or eaten, several smaller axillary stems may develop. Stems, terminating with racemes of flowers, are light green, round (terete) in cross-section and glabrous (no hairs). Growing stems and leaves have white sap. New basal leaves, appearing while the plant is in bloom, persist over winter and may be reddish in color in spring. 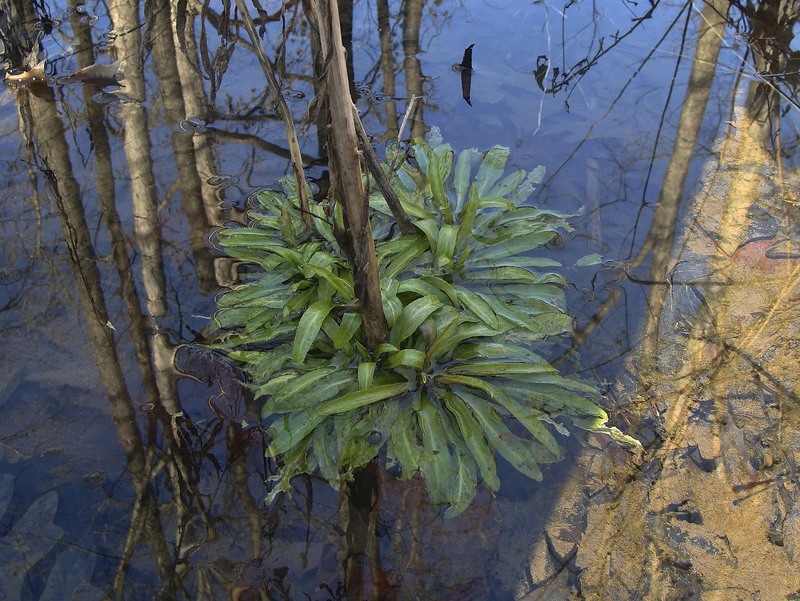 Photo 1: In February, basal leaves grow on this cardinal flower plant in a wetland. Old stems can be seen at center of clump. 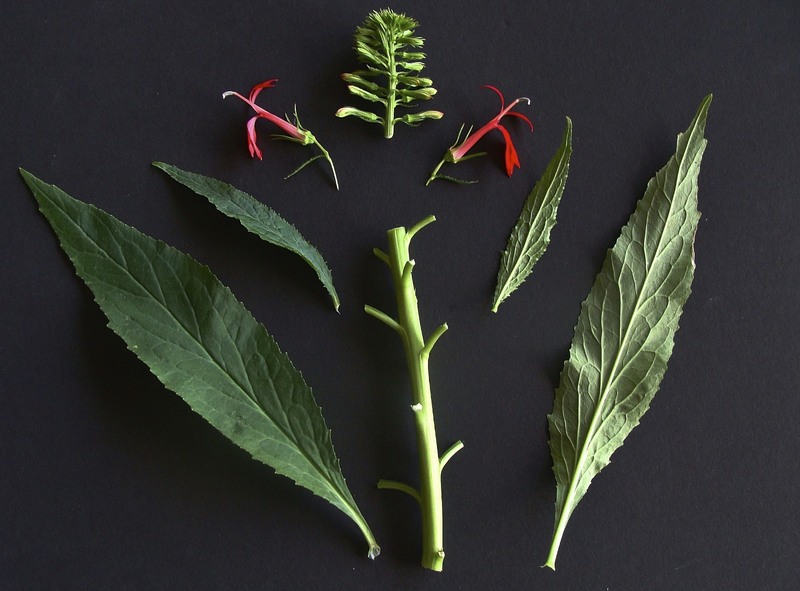 Lanceolate alternate leaves, up to about 7 inches long and 1½ inches wide, are dark green above and light green below and mostly glabrous. Leaf blades gradually taper toward their bases with very narrow blade tissue continuing to the stem. Leaf blades also gradually taper toward the tip (acuminate). Margins are somewhat sinuous and have short, irregularly coarse teeth (serrulate) that are angled toward the leaf tip. Leaf veins are slightly suppressed above and strongly raised below. The smooth upper leaf blade surface has a textured appearance due to upward flexing of the surface between veins. Leaves are positioned somewhat horizontally, but can droop toward the tips. Photo 2: Upper and lower sides of mid-stem leaves and smaller upper stem leaves are shown. Note leaf margins, venation and single bracts subtending flowers. Inflorescences of cardinal flower occur in late summer as erect, terminal racemes, from one-fourth to one-third the height of the plant. Racemes have showy brilliant red flowers (rarely white or pink) that may be sparsely spaced or densely packed. Flowers, on short pedicels, are each subtended by a small linear bract. Flowers mature successively from the base of the raceme to the top, with flowering extending over a month or two, depending on site moisture. 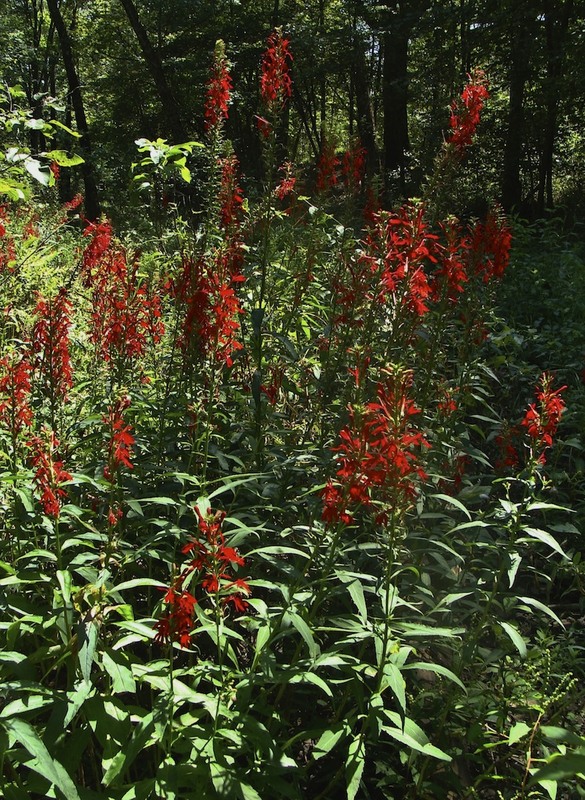 Photo 3: Cardinal flower plants in this wooded wetland are from 1½ to 6+ feet tall. Ditch stonecrop (Penthorum sedoides), at lower right, has an appearance much like cardinal flower in early spring. Flowers, positioned at about 45 degrees off the stem, are about 1½ inches long, with the front of the flower being about ¾ inch wide. Flower corolla consists of two slender upper lobes (flared and not connected to each other beyond the tube) and three lower broader lobes (connected at the bases beyond the tube and projecting out and slightly downward) together forming a fluted tube in the lower portion. The front surfaces of the corolla are a vibrant red (rarely white or pink) while the back surfaces, the tube and the filaments are often a lighter red. Two hazy dark lines can be seen at the juncture of the three lower corolla lobes. Five stamens have fused filaments that form a tube topped with greyish, down-turned and united anthers. This stamen tube tightly surrounds the pistil, which has a two-lobed stigma extending slightly from the stamen tube as the flower matures. A green, bell-like (campanulate) ribbed calyx has a raised rim and five projecting linear lobes. The corolla attaches immediately inside the calyx rim. Photo 4: Two upper corolla lobes are not joined above tube (see arrow). 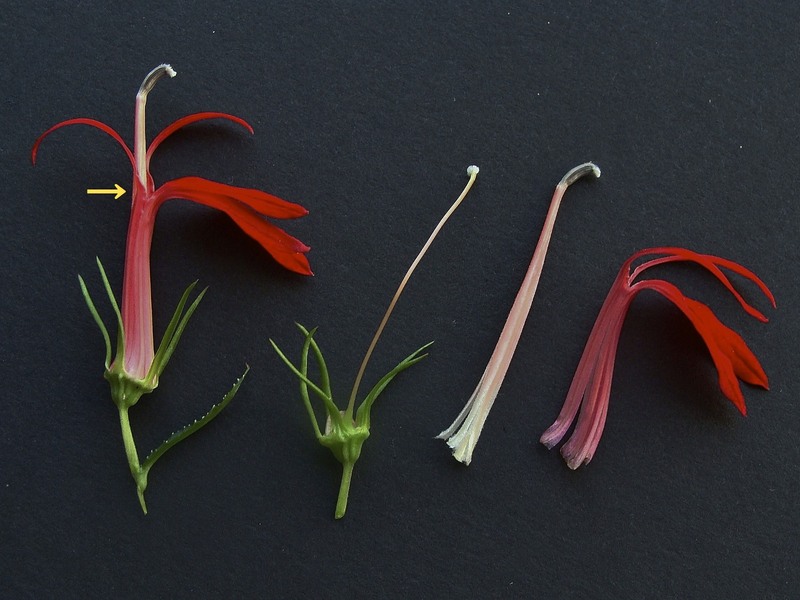 Flower on right separated to show pistil, stamen tube with united anthers, and corolla. As a flower fades, the calyx enlarges. 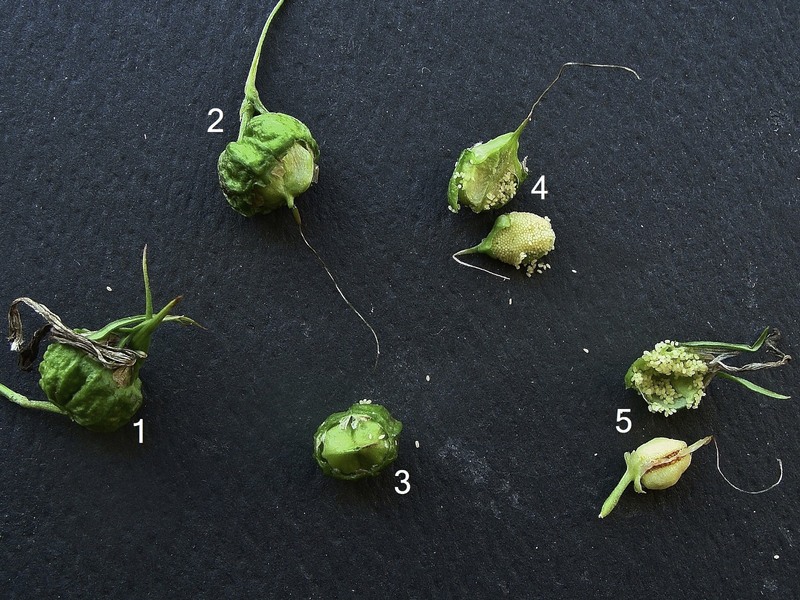 The calyx then serves as lower portion of the seed capsule (fruit) while the upper portion is a smooth, rounded and slightly pointed cap. The fruiting capsule is divided into two sections (locales), within which a dense seed layer develops, such that each capsule contains hundreds of tiny, dust-like seeds. When seed capsules dry, only the top opens to release seeds. Capsules also deteriorate over time and seeds are released for transport by wind and water. Photo 5: 1: Capsule with dry flower and calyx lobes attached. 2: Calyx lobes removed with pistil remaining. 3: Capsule viewed from top, without style and stigma. 4: Capsule split to expose immature seeds attached to central placenta. 5: Central placenta with immature seeds removed to show its two sections. Photo 6: In October, stems and capsules become dry. An open capsule can be seen at arrow. As a garden plant, cardinal flower is an upright perennial of modest size that bears very showy red flowers and lush foliage. It is excellent for water gardens, moist garden beds and slow-flowing streams, but must have near-constant moisture. Cardinal flower is a favorite of ruby-throated hummingbirds, which serve as pollinators, as well as butterflies. Deer may browse plants, but plants may recover by producing axillary flowering stems. Plants can be propagated from seed, stem cuttings in mid-summer or by separating new basal growth in fall. 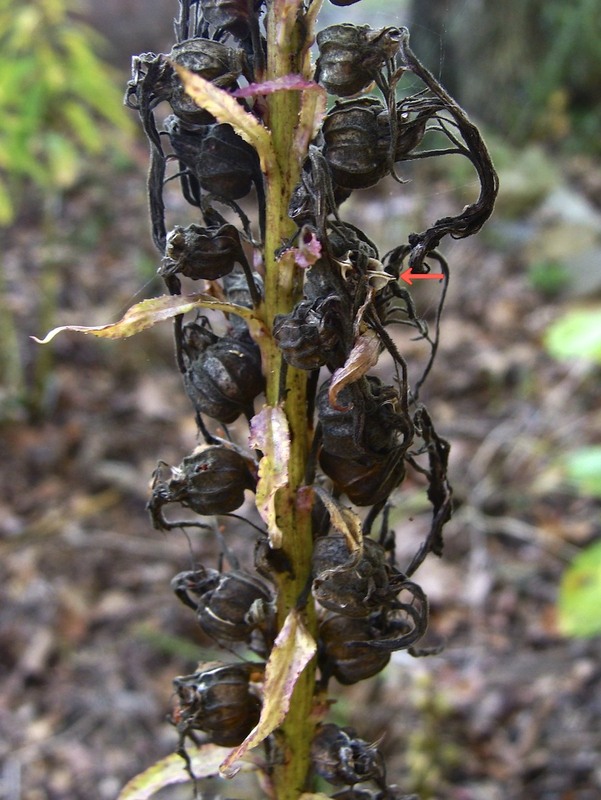 Five other species of Lobelia grow in Arkansas, a few of which can be found in similar habitats and can have foliage resembling that of cardinal flower, especially early in the season–but none have red flowers. Their flowers can range in color from white or lavender to blue or purple. 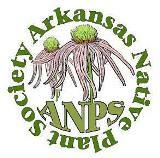 This entry was posted in Know Your Natives, Native Plants, Wildflowers and tagged Campanulaceae, Cardinal Flower, Know Your Natives, Lobelia, Lobelia cardinalis. Bookmark the permalink.